Habitat loss is the biggest threat to Canada's native plants and animals. Preventing this loss is the main focus of the Nature Conservancy of Canada (NCC). We work across the province in the places where our conservation activities can have the biggest effect on protecting Alberta's native species and habitats. Critical habitat to the east and west of Edmonton supports a large variety of rare species and globally significant numbers of migratory birds. The mix of boreal forest (dominated by trembling aspen and balsam poplar) and wetland breeding grounds for North America's waterfowl makes our work around Edmonton vital. This area contains the highest density of remaining native parkland in the central Alberta region. This parkland supports populations of native plants and animals. Its highly productive wetlands, clean rivers and streams and other natural habitats are important for globally significant concentrations of migratory birds and a variety of North American waterfowl. From the tops of the alpine peaks down to the foothills that roll into populated valleys, the Rocky Mountains support some of the most varied ecologies on the planet, including plant, animal and human communities. NCC has a long history in the Canadian Rockies. We are the largest and most successful land trust organization working in this region. 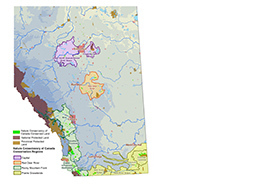 NCC has directly conserved more than 273,000 acres (110,500 hectares) in Alberta and British Columbia. We have facilitated the conservation of another 523,000 acres (211,650 hectares) by working with partner organizations and various levels of government. Grasslands are fragile but ecologically important. Birds such as burrowing owl, ferruginous hawk and peregrine falcon are iconic grasslands creatures that are under increasing threat from habitat loss. More than 75 per cent of Alberta's original mixed grassland has been converted to tame forage and annual cropping. Only 17 per cent of the original fescue grassland remains.